Asparagus is one of those green vegetables that you need to eat for many reasons that I've written about here. Now available year round in most localities, it is especially delicious in the spring when the shoots are thin and tender. Use the recipes below to enjoy this vegetables and all it's health benefits. I am also going to introduce you to two inexpensive pieces of equipment that will give you a lot of cooking options with many types of vegetables, not just asparagus. If you're not sure how to prepare asparagus for cooking, here is a video you can watch. The best way to enjoy all the flavour of asparagus is to just steam it. 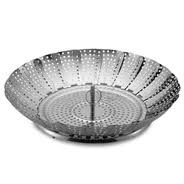 One of the basic pieces of equipment in your kitchen should be a steamer basket that you can fit into any large pot. This will cost you under $10 in any kitchen store or department. The way it works is you put water in the bottom of the pot, and then put in the basket so it creates a flat surface for you to put your vegetables. You want enough water to just come up to the steamer insert but not so much that the vegetables are sitting in the water. Put in your vegetables, cover the pot so the steam will stay inside, then turn the heat up to high so the water starts to boil. For most vegetables, once the water is boiling and you can see the steam, turn off the heat and leave the lid on. 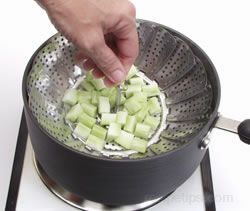 By the time the water has cooled ( 5 to 10 minutes) your vegetables will be ready to eat - tender but still crispy. For denser vegetables such as cauliflower or chopped rutabaga you will need to let the water boil for up to 10 minutes so the vegetables are soft enough. Check every few minutes until they reach the right stage of doneness. 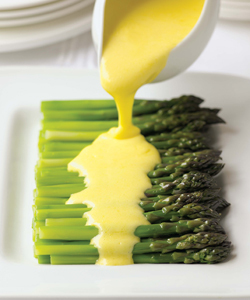 Steam your asparagus as described above, then serve it with Quick and Easy Blender Hollandaise Sauce. If you barbecue, now is the time of year when you are probably starting to enjoy food prepared like this again, and buying a barbecue basket will be a good investment for you. 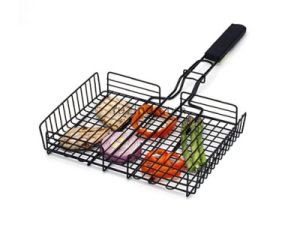 With this piece of equipment in your kitchen you can now barbecue not just meat and chicken but also vegetables and delicate pieces of seafood that otherwise would be difficult to handle. At the time I write this you can get a grilling basket for $15 to $20. Grilling vegetables is a very easy procedure. Here is a recipe for asparagus that you can use for all vegetables as they come in season. - Preheat grill for high heat. - Grill over high heat for 2 to 3 minutes, or to desired tenderness. ** I find the easiest way is to put them into a plastic bag with a spoon full of oil and toss them until coated. Keeps your hands from getting covered with oil and you can keep those plastic bags your vegetables come in when you buy them for this purpose. 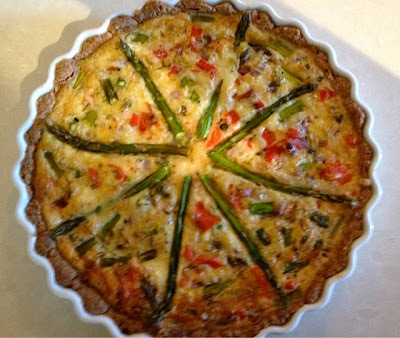 This is a version of the basic quiche recipe, but this time I am also giving you a savoury nut crust recipe should you want to make it a more substantial meal. You can make it with or without the crust. A bunch of asparagus the way it's usually sold in the store is about the right amount for this recipe. (about 16 to 20 thin stalks) The asparagus does not need to be cooked ahead for this recipe. And if you can get wild smoked salmon, it's worth splurging to use in this recipe. You might think in a quiche it would be wasted, but you would be so wrong. It tastes like the most amazing meal at the most amazing restaurant, and you will be hard pressed to keep your serving to just a quarter of the quiche. - Combine the almond flour, coconut flour and melted butter until it forms a dough. Spread this with your fingers on the bottom and sides of your quiche or pie plate. Remember, since this is a nut crust it doesn't need to be thick, in fact the thinner you can make it the better. I tend to use most of the dough on the sides to create a nice top crust. - Bake for 15 minutes, then let cool. - Reheat the oven to 400'F. - Combine the cheese, salmon, chopped asparagus and red onion in a small bowl and toss lightly. Spread this mixture over the bottom of your baked crust. - Beat the eggs with mustard, nutmeg, dill and salt and pepper in a separate bowl. Add the warm cream and beat again until well combined. - Pour into over the filling in the pie crust, making sure it covers all of it evenly. - Bake the quiche for 15 minutes then lower the oven temperature to 325'F and bake for a further 40 minutes. A knife inserted into the centre should come out clean. 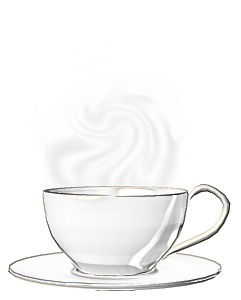 This can be served either warm or cold. 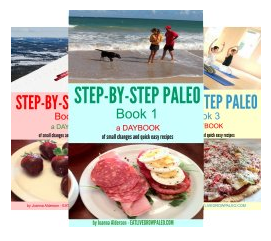 (will freeze ) Freeze whole or cut into individual servings. Place in freezer containers or flash freeze first then store in a ziplock bag and put back into the freezer until needed. 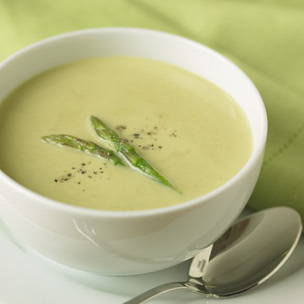 Another wonderful way to eat this vegetable is in Asparagus soup. A bowl of this with your lunch salad will warm you up on any cool spring day. 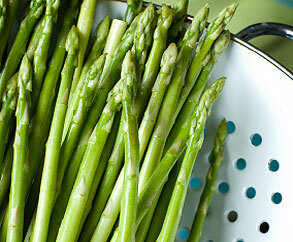 - Prepare the asparagus as shown in the basic preparation video above. Cut the stalks into 1 to 1 1/2 inch pieces. - Grate the zest and juice the lemon. - In a medium saucepan cook the onion for 10 minutes until it's very soft. Add the parsley, lemon juice and rind and the chicken broth and simmer just until the asparagus is tender, about 5 minutes. - Remove 12 asparagus tips to use as garnish and set aside. - Puree the soup in your blender, food processor, or with an immersion blender. Strain through a wire mesh strainer to remove any fibrous bits. - Add the cream and reheat the soup in the pot until hot but not boiling. 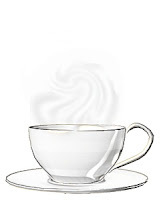 - Serve with two tips in each serving for garnish. 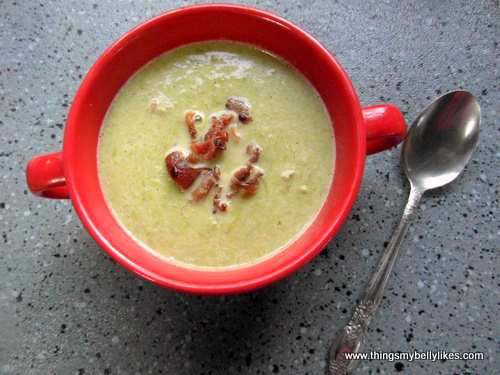 To make this into a whole meal soup, you can add bacon to this soup. Chop a lb. of bacon into small pieces and use instead of butter to cook the onion, then add the rest of the ingredients. You can also top with crumbled bacon along with the asparagus tips when serving.